Based on the space cannon envisioned by Jules Verne, this version of a space gun employs rings of explosive material along the length of the barrel. 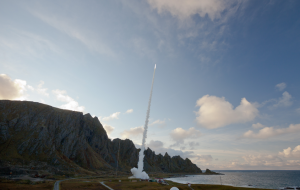 Instead of relying on one single detonation to propel the payload along the entire length of the barrel, the wave accelerator will use precisely timed detonations to drive the payload along the barrel with waves of pressure. 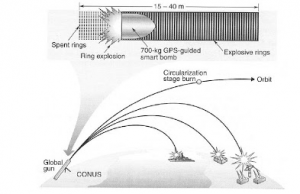 Essentially, each detonation will occur just as the payload passes the location of the explosives in the barrel, and it is hoped that each detonation will add a cumulative acceleration, which must be sufficient to carry the payload into orbit under its own momentum once it leaves the barrel. Timing the detonations is the easy part- providing the payload with the means to insert and stabilize itself into a pre-determined orbit is something else entirely, as is protecting the working part of the payload against the effects of repeated detonations. No solutions to these design challenges have been offered to date. Learn more about Blast Wave Accelerator on Next Big Future.